A better Bluetooth keyboard for your Mac or iPad. 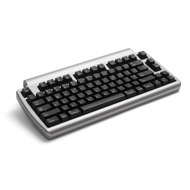 This compact, wireless keyboard will connect to any Bluetooth enabled device and features modern key switch innovation reminiscent of the sound, feel and durability of the early Alps mechanical key switching of Mac keyboards. Devotees of the Apple Extended Keyboard II will find comfort here. The sculpted keys provide a home base for fingertips and the laser-etched characters will never fade. This wireless, Bluetooth enabled keyboard is whisper quiet but provides tactile feedback allowing you to type your fastest. 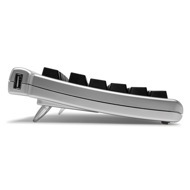 USB ports allow you to charge the keyboard fully in less than five hours and it holds a charge up to six months. Use the other USB ports to charge two other devices. 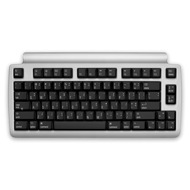 Built with Mac as the muse, this keyboard offers many of the hallmark features of the popular Apple Extended Keyboard II, but the wireless Bluetooth capability allow it to sync with any Bluetooth enabled device. Keys sculpted to cradle fingertips and provide a firm home base and the laser-etched characters ensuring against fading. While you are breezing through a document, you needn't worry about ghosting (missing characters or unwanted characters being inserted) as the Laptop Pro's Anti-ghosting circuitry virtually eliminates this problem. The keyboard will keep up with even the quickest typists. The laptop Pro's function keys behave in Apple fashion letting you control screen brightness, volume, iTunes and desktop layout. If you need to momentarily engage the "F" keys, there is an "Fn" key to do so. No expense was spared to make this the best Bluetooth keyboard possible. That includes putting a much bigger battery in it than necessary - 1,600 mAh. That's big enough to last 6 months to a year, on a single charge (under normal use). USB ports allow for the keyboard to charge in under five hours and the other ports can be used to charge other devices. The attractive and highly compatible finish makes the Laptop Pro an easy fit in your Mac mix but looks great with most any computer system. 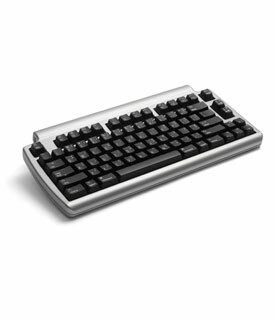 This compact keyboard leaves more available space on your desktop and the lack of wires guard against clutter. Your mouse is closer so you needn't reach quite so far to control it. The size allows for mobility and portability for home, office and anywhere else. 13.26" x 6.5" x 1.38"
Sorry, but your browser does not support iframes.